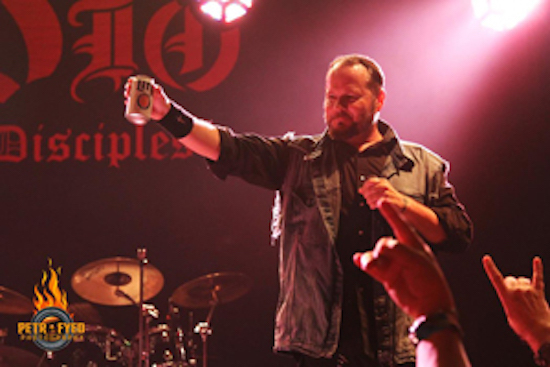 Ruben Mosqueda of KNAC.com spoke with singer Tim “Ripper” Owens (Dio Disciples, Three Tremors, Iced Earth, Judas Priest). Portions of the interview appear below. KNAC.com: The Three Tremors (featuring Owens, Sean Peck [Cage] and Harry Conklin [Jag Panzer]) was thrown out there at one point by Bruce Dickinson Rob Halford, and Geoff Tate, several years ago when they toured together. They toyed with the idea of doing something together and wanted to call it The Three Tremors. Was there any apprehension to go with that name? Owens: The name was Sean’s idea. Here’s the thing: like you said it was mentioned years ago, but nothing happened with it. It was a name they threw out there, like you said, it wasn’t taken, no one owned the name, there was never a website or anything. Now, if they reached out to us and said, “No, no, no, we’re going to use that name,” we would have moved on, but they didn’t. If they didn’t want us to use it, they definitely would have reached out to us. KNAC.com: I have to ask you about The Dio Disciples. I believe you’ve been a part of that from its inception. Is there an album in the works? I have read stuff that there would be an album of all original material. Owens: Listen, I’m a fan of Dio and I’m a fan of the records that the Last In Line guys performed on. Listen, we’re both celebrating Ronnie [James Dio], I don’t know what the problem is? Let’s just go out and celebrate Ronnie, it’s what we do. I know Ronnie liked me and he liked the guys in my band, that’s really all that matters. You know Last In Line came through my town, and unfortunately I was out of town, otherwise I would have been there and I would have hung out with the guys. There’s no question about it, I saw their new video and I love that song. No problems here, it is what it is. KNAC.com: …favorite cover to perform or that you’ve recorded? Owens: No question, Imagine. I haven’t recorded it yet, but I do it live anytime I do any acoustic shows. I like doing my version of that because I inject a lot of power and a lot of soul into it.